Just for fun, some chat about this. I’d been tolerating a slow desktop for some years. I bought it for about $100 when the hard drive crashed in an older computer. A refurbished Dell, it was nice when I bought it. The Dell is sitting just to the left of the middle of the screen. It long ago ran out of disk space, and much was moved to a USB backup drive. I bought two 500 GB backups when I was planning on travelling with Lucy in 2016. To the right of the Dell are two USB hard drives, the upper one is that 500 GB Seagate, and blow it is a 4 TB drive, bought just before ICCF-21 for under $100. Before the office clean-up, The Dell lived under the desk, and was intensely covered with dust, and so were the backup drives, sitting on the floor. 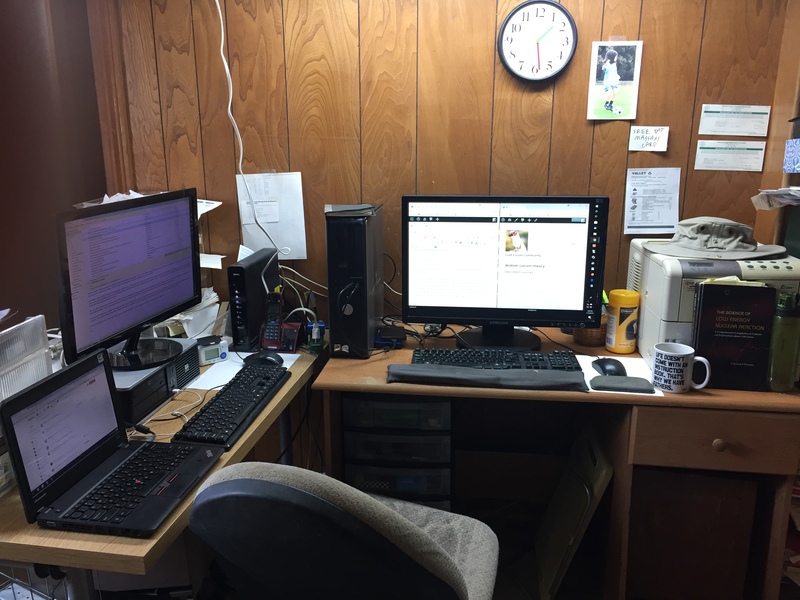 To the right of the Dell is a 24″ diagonal monitor, given to me by a friend, and gathering dust in my office until the clean-up. I’m using it now to work on this blog. I’m redesigning the Widom-Larsen page, so, normally, it has the main page on the left, and then subpages on the right, so I can see the overview and the specifics on the same screen. I used to have twin large CRT monitors, now gathering dust in the basement, and had a dual display graphics card in a Windows 2000 Professional Server system, so I could run Remote Desktop as well. That all gradually went downhill, particularly when Microsoft stopped supporting Windows 2000. Server systems are expensive! So I am now returning to functionality similar to what I had over a decade ago. Thanks to all those who have supported my work, I can afford the modest cost that is now involved. Computers and accessories have become amazingly cheap, if one can use the not-quite-latest-and-greatest. The bleeding edge is bloody expensive! On the far left is the Thinkpad Chromebook I bought to take to ICCF-21. $100 refurbished. Fast, way cool. Only down side so far: no touchscreen. I have an ASUS convertible, one of two bought back in 2016 for that USA trip, for about $200 each. I used the ASUS on the trip to Florida. As a convertible (with detachable keyboard) it does have a touchscreen. So my next portable will have that, I expect. But I couldn’t resist the $100 price for the Thinkpad, which has a neat blinking LED behind the dot on the i in Thinkpad. Long battery life, too. To the right of that is an HP Compaq desktop, $100, that arrived the other day. Refurbished — absolutely clean, perfect — it has a wimpy internal hard drive, by today’s standards, but … I have those USB drives, including an extra 500 GB Seagate still in the box from 2016. I have a huge email system, and accessing it with the Dell was becoming frustrating because of delays. The HP is fast, really fast, for the same tasks. 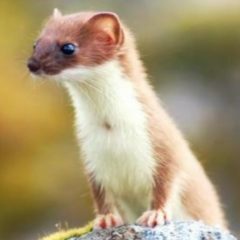 (I am now using Thunderbird, having abandoned Eudora last year, and eventually deciding to keep all the mail on the domain server, where it can be accessed from many computers and my iPhone.) So, right now, the HP is showing my Inbox, on the monitor above, and I mostly keep it that way. On top of the HP is the 21 inch monitor I’ve been using for quite a few years, since an older LCD monitor failed. To the right of the HP, there is an xfinity cable modem and router, a wireless phone (that uses the xfinity system for VOIP), and a white cord can be seen plugged into a power strip. The white cord is for a flourescent standard shop light fixture, giving me lots of light. I unplug it to turn the light off. On the far right is a Kyocera laser printer, bought years ago and still chugging away. While expensive when bought, it was claimed to be low maintenance cost, i.e., low cost per page, and it has proven to be that. In front of it is a coffee cup given to me by my Ethiopian daughter last year. Nice message. Reminds me of what is important. On top of the Kyocera is a Tilley hat. Dewey Weaver knows about those. In front of the Kyocera is also a book, the best book to date on LENR, Storms (2007). As can be seen, it has many Post-It page markers. Not seen, under the table on the left: two 550W UPS units. I just bought one, for under about $50, because the older one, getting long of tooth, was starting to occasionally trip, beeping at me, but, in fact, still keeping the computer running. I don’t understand that. To stop the beeping, I needed to turn it off, but when I turned it on, the computer was still alive, had not been shut down. Mystery. Eventually, I may replace it, but for now, it’s not critical. The lead-acid batteries in these things, cheap and powerful, eventually die. To really get serious, I’d set up some car batteries and could provide many hours of power. I probably won’t get that serious. Under the central desk, picked up from a neighbor’s discard, is a plastic many-drawer unit on rollers, used for supplies and miscellaneous stuff, like tools. To the right of that desk is a bookshelf with some books and supplies. Off the image to the right is a Canon multifunction inkjet printer/scanner,fax. Purchase detail: while I use ebay very often — for example, to the right of the ASUS monitor is a blood pressure device, I think it was $12 with free shipping — the recent purchases were all from tigerdrect.com, which often has amazing deals, matching or surpassing what I find with more work on ebay, and with less risk (though I’ve had very good results with vendors on ebay) — and very fast shipping even the cheap version. That’s “Sushi Quality Wild-Caught Ahi Tuna Steaks,” from Aldi, 12 oz. total, in three frozen individually-sealed bags, for $5.69. 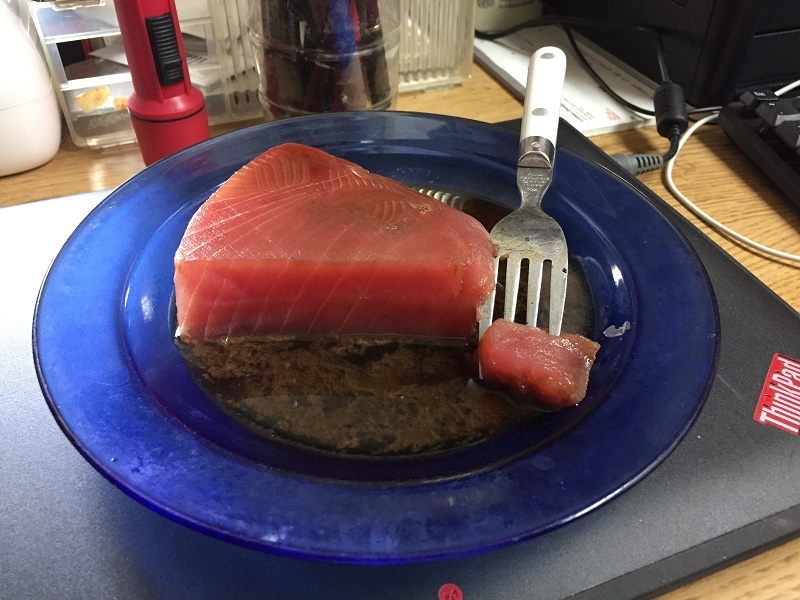 So when I want some sashimi, I drop one of the individual bags in a tub of water, and wait a few minutes, and it’s thawed, and fantastic uncooked with soy sauce, as shown here. Melts in the mouth.